I’m in an undisclosed location (Sorry: No narcs) listening to six dudes who aren’t supposed to be in a rock band being the best rock band in the world—well, at least in a 30-mile radius—at 5 pm on a dreary football Sunday in January. And, right now, in the middle of this undisclosed location, I’m as amped up as said six dudes, who are blazing through a selection of 80’s “college rock” obscurities from the likes of R.E.M., Hoodoo Gurus, and Guadalcanal Diary, not to mention like-minded classic rockers such as the late great Tom Petty’s “American Girl.” The tempos are powerfully fast—so much so that the drummer (of all people!) wonders if they should slow it down. No way: It’s perfect… But maybe they’re just ready to wrap up and watch the Saints play. To watch The Underhills from this close vantage is to be reminded of the transformative—and restorative—power of music. But it’s not just about being in love with music in general—but performing it: The physical act of creation. Guitarist Mark Haas strikes an impressive pose while conjuring a shrieking solo reminiscent of Dinosaur Jr.’s J Mascis. He’s locked in with his creative foil, drummer George Carbonie, who’s looking back at him wide-eyed while keeping the breakneck pace. Bassist Jeff Logan and guitarist Ben Fulmer are steady and stoic—locked into the groove. Mike Barlow grinningly presides over an impressive keyboard set-up (including a vintage synth and an iPad displaying sheet music which he’s annotated by hand), joining Fulmer on backing vocals and occasionally whipping out a harmonica – a touch that perfects a spirited rendition of R.E.M.’s “Driver 8.” In the eye of the storm is Frank Cater—the band’s singer and frontman—barrel-chested, both hands on the mic stand, belting out the songs. The blissful look on his face—and the occasional dance move—is telling… And contagious. Not bad for a bunch of “old” guys. Afterward, the band is happy, if not a little skeptical—even self-deprecating. The sublimate of all the faint praise and smack talk is a giddy, pure pride. That’s all part of being in a band. And The Underhills are very much a band. Here, in the 2nd decade of the 21st century, the idea that anyone should be too old to rock—much less make any sort of art—is absurd, if not ageist. The Rolling Stones have been “too old” for at least 30 years, and it hasn’t hurt ticket sales. But, in The Underhills case, they aren’t playing a clutch of original material, rather songs that mostly come from a subset of 80’s music that has become largely ignored in the current cultural conversation— the aforementioned College Rock—a blend of pop, punk, funk, Americana, and psychedelic music (among other things) that would eventually develop into the arguably more useful sobriquet, “Alternative Music.” Sure, they play some classic rock, some Outlaw Country, and even a few selections from The Grateful Dead and Widespread Panic, but they all feed back into the band’s well-curated approach. The Underhills are all between 48 and 53 years old. They all have families—some with kids in college. They are all professionals in their respective careers. They have been playing music together for a decade but, with the exception of bassist Jeff Logan, none of them have been in bands that gained any real traction. Even then, Logan’s band, Bone Dali, were local legends with a growing regional following—but like his fellow Underhills, he eventually decided finishing college and finding a career was more important than chasing a music career. MARK: “The engine that makes the whole thing go is Frank. You take him away, it becomes pretty ordinary pretty quick. It’s no surprise that all of The Underhills insist I spend time with Frank. Being on stage—performing —is his superpower. In a sense, he represents the collective group on stage. He is their spirit animal. Despite his past experiences, Logan’s inclusion into the nascent band didn’t bring with it any extra authority, but he helped instill a crucial bit of confidence. This attitude and approach are crucial to The Underhills. Of course, they want the audience to have a great time, but this is also a creative endeavor. And any creative endeavor worth its salt thrives on tension—with the audience and, often, within the band itself. MARK: “Everybody else calls us ‘The Odd Couple.’ I’m the fastidious neat freak (Oscar?). I like the details right. There have been a few other people that have floated in and out of The Underhills. But George Carbonie, along with Mark, Frank, and Jeff, are The Fab Four—the foundation of the band. There was initially another drummer, but he was having trouble making practices. Desperate to work out some material, Frank suggested George as a ringer. “I had never performed for anybody.” Says George. “Frank called and said, ‘Hey do you play drums?’ For some reason he thought I played drums—and I didn’t—I don’t know where he really got that idea. But he said that his son had, literally, this little kid drum set in his basement and said, ‘Will you just come over and play them a little bit while we try to figure this out?’” Once assembled, Mark played the opening riff to “Wild Flower” by The Cult. When George responded with the correct drum fill… Well, they became a band. Mark and George may love to talk smack about each other but their bond is undeniable. 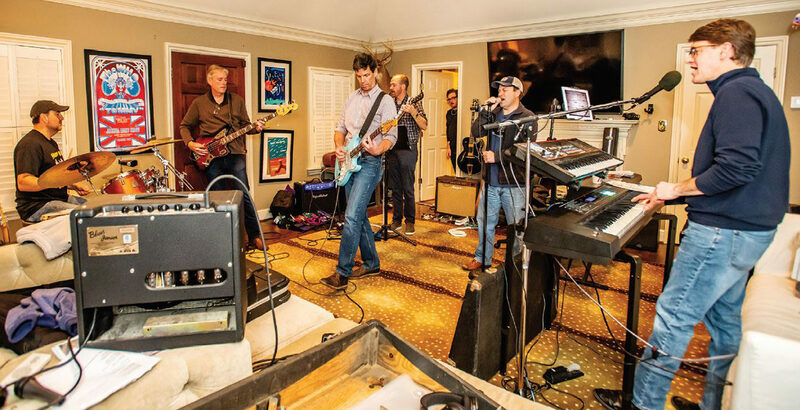 They may have seemingly opposing philosophies— grounded in their love of playing music—but that push and pull is what makes The Underhills rock. And though Frank is a force all his own, Mark and George are the group’s most physical musicians—and it’s that palpable energy that sends their music reeling. Mark Haas grew up in Mobile and went to college in Auburn. WEGL, the college radio station, was crucial. That stance has proven successful both as an act of agency and a path to their current success. 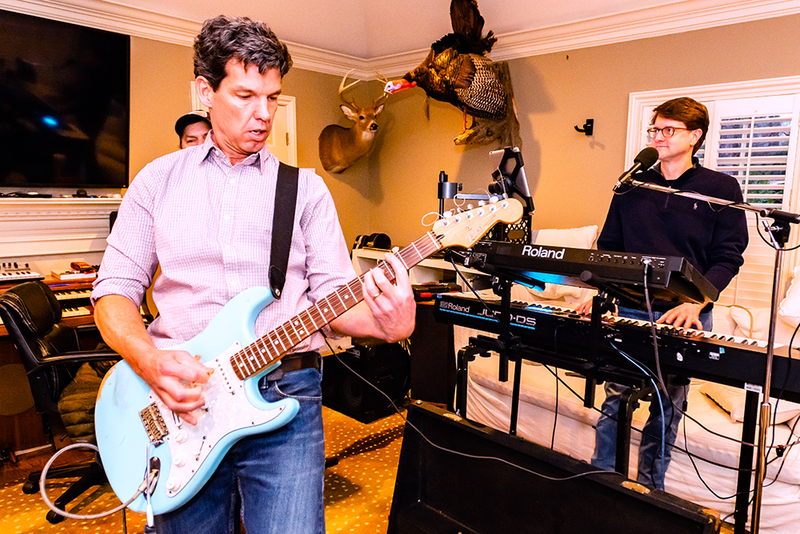 When Halloween rolled around again, the band played a party in Frank’s basement to somewhere between 50 and 80 people. The band later scored a gig at MAFIAoZA’S in Crestline. Though it was not unusual for the pizza joint to host live music—usually low-key acoustic music—they cleared out all the tables in the main dining room and let the band hire both a stage and a sound guy. They packed the place out, so they did it again. And again. Those people are dancing, singing, and partying their asses off, too—including their wives who, when it comes to choosing new material, have become a crucial barometer: If they’re up front dancing and singing along, then they know they’re doing something right. Now those kids are extending invitations to play their respective schools. 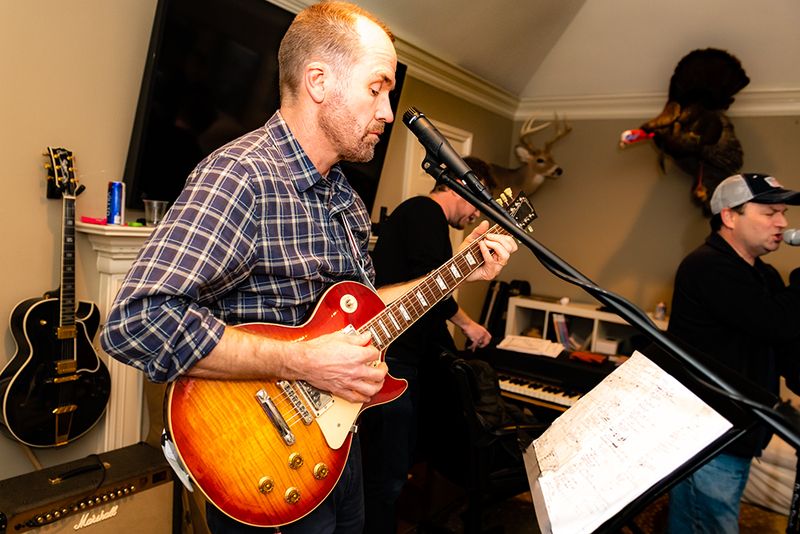 And while they’re not interested in playing frat parties or whatever, they are thrilled that music is creating an even deeper connection with their kids—some of whom are musicians themselves, including Mike Barlow’s daughter and Ben’s eldest sons. But The Underhills are also grateful for the family they’ve found in each other.